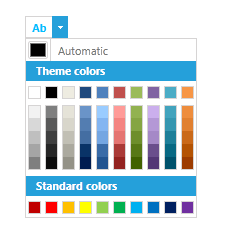 This article shows how to set custom content in the SplitButton of the ColorPicker. In some scenarios you may need to change the default "A" - like picture in the RadColorPicker. In order to set custom image or text in this field , you need to use the ContentTemplate property of the RadColorPicker.